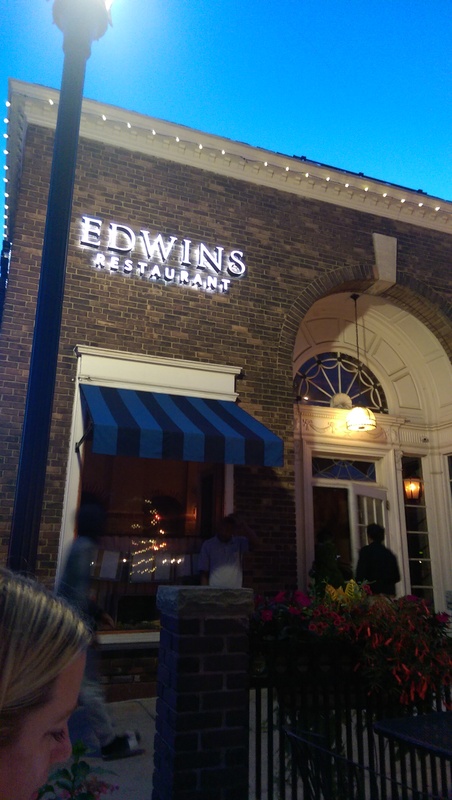 My friends and I met at EDWINS on Shaker Square for dinner last week. 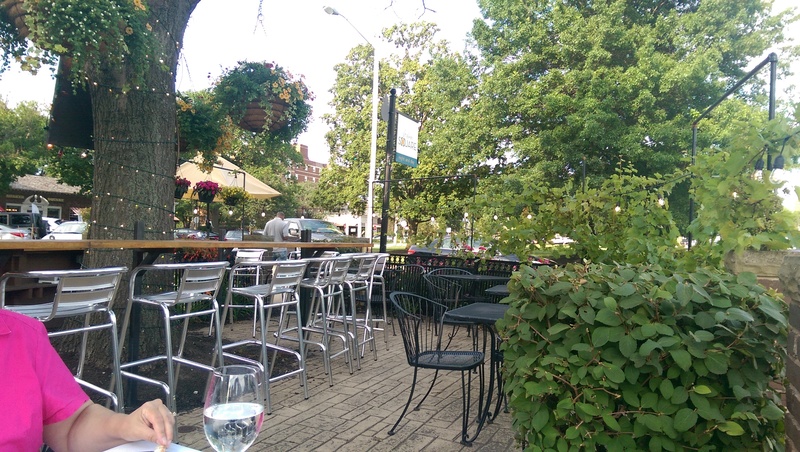 We took advantage of the amazing weather and chose to sit outside on their patio. It was 65 degrees and sunny with a light breeze. The night was practically perfect. When we sat down we were asked if we wanted still or sparkling water, and they kept our glasses topped off the whole night. I enjoyed my Hemingway Daiquiri, but was less enamored with the French 75, which was made with gin instead of champagne as I am used to. The service was exceptional from start to finish. The staff is trained here for six months, three months front of house and three months back of house. EDWINS just does a great job preparing them for the food service industry. We are lucky to have it here. A little birdie told us September’s Dinner in the Dark will be at EDWINS, and they will be inviting some of their graduates to come cook for us. Nancy said the last time they did it it was exceptional. I had decided to treat myself to Le Burger, which is prepared tableside, but was waivering between the burger and the steak. Our server insisted Le Burger was the right choice, no matter what. 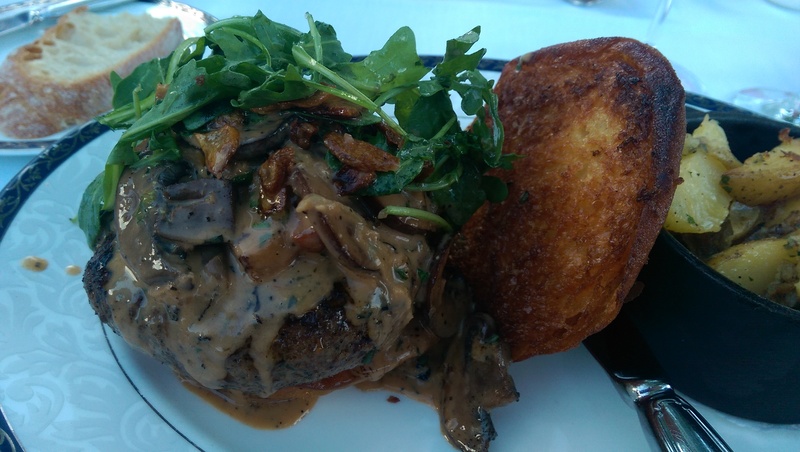 Le Burger features hand ground beef, bacon, mushrooms, fried garlic and sauce Diane. Not just any beef, but filet ground right at the table with herbs then added in. 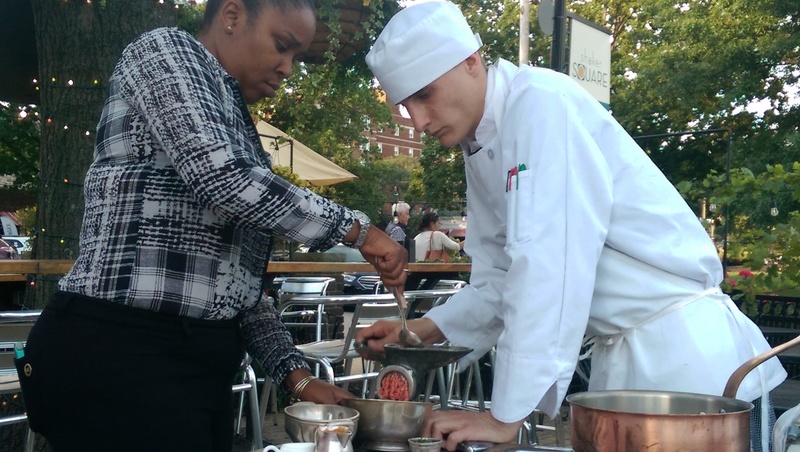 Our tableside preparer had trouble with the grinder (some part wasn’t moving properly), but once it was fixed it worked perfectly. The formed burger patty was then taken inside to grill while the preparer makes the sauce Diane. He started with goose fat, then added butter, bacon, mushrooms, shallots, Worcestershire sauce, dijon mustard and garlic. 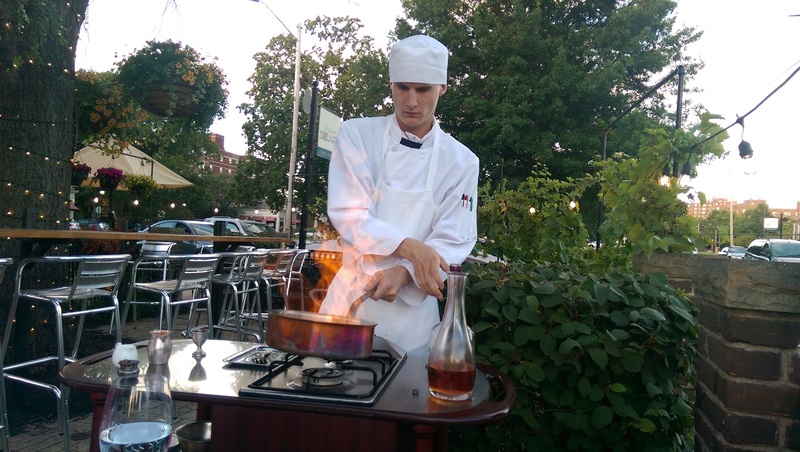 He then added brandy and flambéed it up. It was quite a sight to see. Then he added cream to the sauce and let it thicken until the plated patties were brought back out to be finished. The patties were generously topped with the sauce and arugula and served with a side of goose fat fried potatoes, which were absolutely luscious. The burger was tender and cooked to my specifications. My friend Nancy also thoroughly enjoyed her burger, while her husband loved the steak and asparagus. I also ordered a side of the Broccolini Polonaise to get some veggies in. 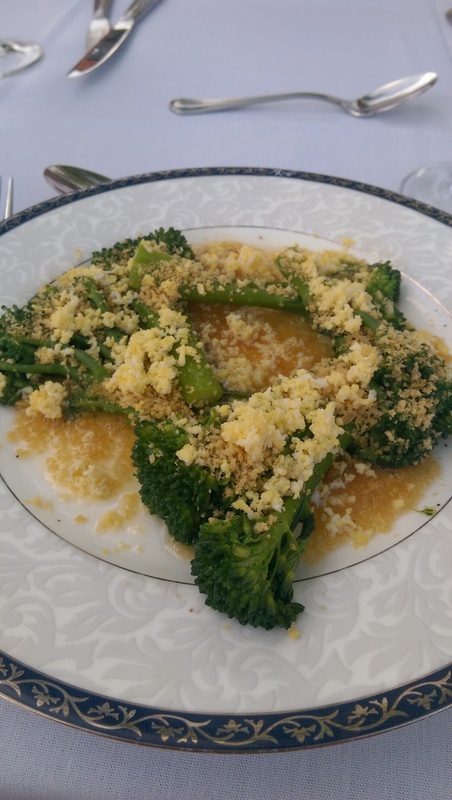 The broccolini were perfectly cooked and served with brown butter, breadcrumbs and grated hard-boiled egg. I thoroughly enjoyed it that night as well as with the other half of my burger the next day. I continued the tableside theme by ordering cherries jubilee. I had never had cherries jubilee and had always wanted to try it. 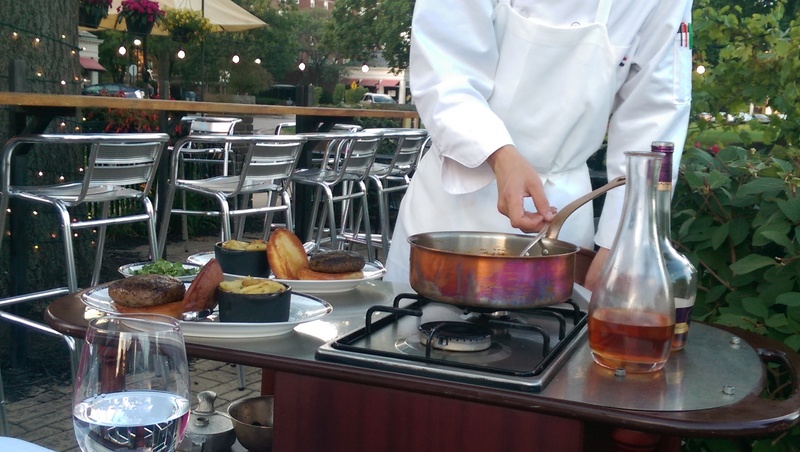 They used to prepare bananas foster tableside, but now they serve it as a french toast dessert. I had a different preparer for this course. The melted butter, cherries and sugar were heated in the skillet along with some lemon juice. Once the cherries softened and reduced down a bit he added some alcohol (if I remember correctly rum and Grand Marnier) and flambéed it up. It was served with some housemade vanilla ice cream. The cherry sauce had thickened and hardened a bit, so I had some bites that were a toffee-like consistency and some that were creamy. 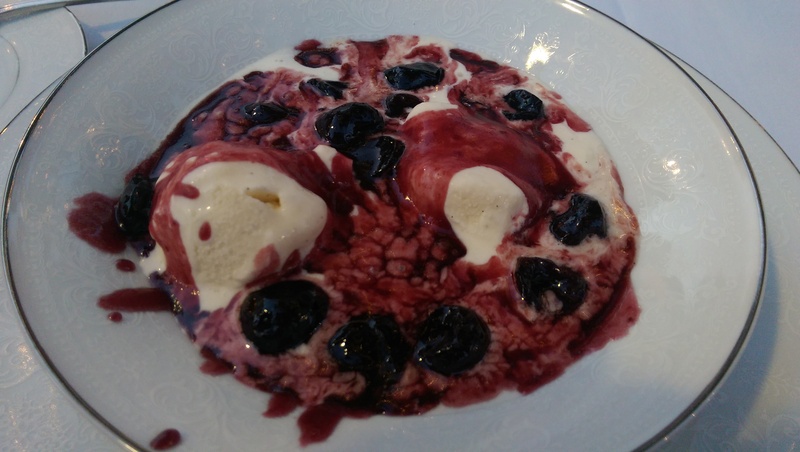 The deep red of the cherries looks amazing against the white of the vanilla ice cream, and the flavor is even more amazing than how it looks. 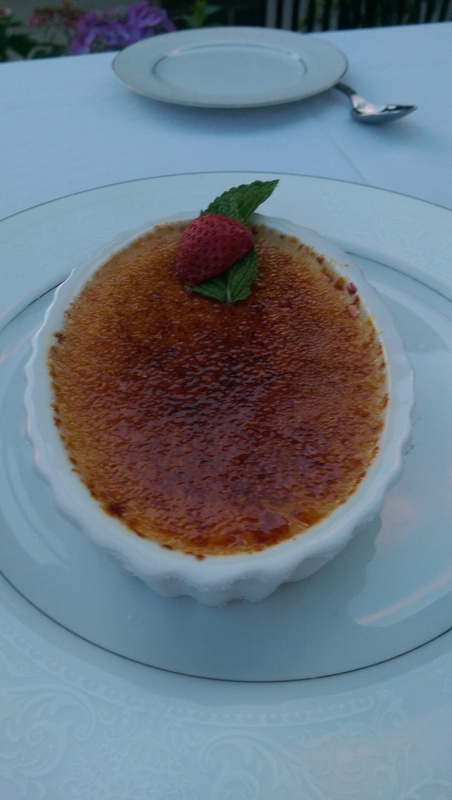 I enjoyed it a lot, but the real star for me was the Creme Brulee. My friend let me have a couple bites of hers, and it was just about the best I’ve ever had. The sugar was thin and flaky, and the eggy custard was amazingly delicious. I will be going back for that again soon! 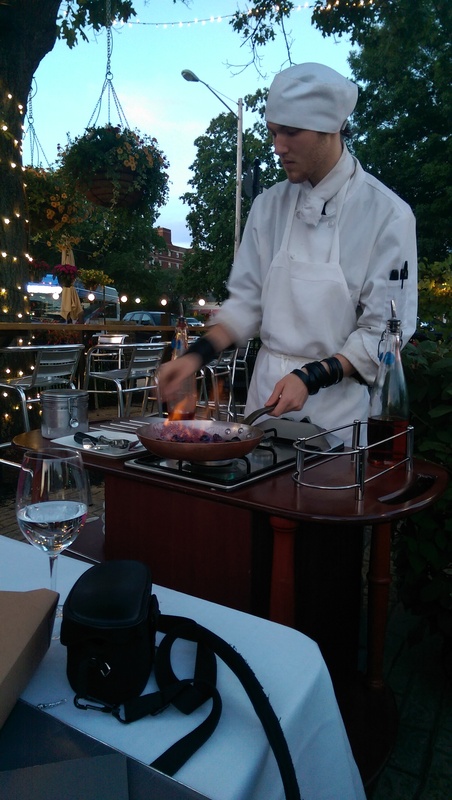 Sitting outside on the patio and enjoying the tableside service was truly amazing, but they also offer the service inside all year round. The preparers both agreed it was a little trickier outside than inside, but the flames did not go out so I consider it a success. Apart from one friend who didn’t like her eggplant (but enjoyed her Chocolate Pyramid dessert and was pleased with how the staff handled her not liking the eggplant) we all went home very happy with our experience at EDWINS.